If you’re recently retired and hoping to hit the open road (without blowing your life savings in one go), we have a few tips for you! Essentially, camping on a budget requires a bit more planning than some people might like, but the money saved is worth it in the long run. Here are a few creative ways to save while RVing across North America. That means you should have enough propane on hand to last a few days without hydro. When you do need to buy propane, box stores like Costco sell refills for a fraction of the cost of small-town private sellers. If you’re travelling through small towns, leave prepared with enough propane to get you through to the next big city. Lots of grocery stores offer their own discount cards, points, and ultimately savings. Before shopping, visit the customer service desk to ask about their store card deals. Most are free to opt-in. Even if you don’t think you will shop at that store ever again, a few dollars saved here and there outweighs the couple minutes spent signing up for their card. Also, consider grocery and fuel discount apps to help save on groceries and fuel. The same discount cards you sign up for in grocery stores might give you reduced fuel prices at nearby gas stations. This is a commonality in the USA especially. The gas buddy app is a life (and money) saver. It might be tempting to pull into every road-side diner you pass while on a long road trip, but saving money typically requires eating in. For days on the road, pre-make picnic lunches. If there are local spots that you just have to try, plan ahead so that’s part of your entertainment budget. You stopped to buy groceries for a reason! Some Walmart and Canadian Tire locations offer free overnight parking for one night. It’s not ideal, but it’s a last-minute option that saves money while on your way to the final destination. If you will be travelling through the USA a lot, look up Bureau of Land Management (BLM) public lands, and be prepared to boondock! Lots of campers explore remote areas off the beaten path by finding an up-to-date BLM map. Also, check out resource websites like boondocking.Org and search the various Facebook Groups for updates on free camping spots. Most of us already pay memberships for CAA’s roadside assistance. Not everyone knows that this membership comes with quite a few perks-like discounts elsewhere. Not just for accommodations, but some restaurants, automotive repair shops, entertainment, online retailers, and more! Even if your original plans aren’t to stay in one place for a week, the money saved might be enough reason for a change of plans. Lots of campgrounds offer weekly rates at a discount. With Wi-Fi connectivity expanding, it might be time for you to weigh the pros and cons of paying for expensive data plans versus relying a little more on the internet at each destination. This doesn’t mean you need to cut your data altogether, but you might be able to get away with 2GB per month instead of 4GB. This could be interpreted a few ways. Either install solar panels on your rig to save money in the long run, or literally follow the sun south to save on propane to heat your camper. You probably chose the travelling lifestyle to spend more time in the sun anyway! The locals are your friends, especially in small towns, meaning it’s a good time to be extra nice and make some new friends. There’s always a local camping spot only a few minutes from their permanent home (They might even have you for dinner!). Plus no one will know local tips and tricks, and must-see places in town better. Regularly check and maintain your RV yourself to save money. You don’t need to become a full-fledged mechanic – you’ll want to keep the big repairs and confusing stuff to the pros. Just learn how your rig works so you can keep an eye on how it’s running before any expensive problems put a damper on your road trip. If you keep your travel plans flexible but also plan far in advance, you are bound to find the best deals! This goes for any kind of travel. Things like early bird discounts are golden. Grab the opportunities that come your way. Larger campground chains sometimes offer discount camping for their members. A quick internet search goes a long way when deciding on what campground to go with. Look for the ones with memberships in multiple locations, then plan your road trip around these accommodations. You might experience a few bumps on the road. 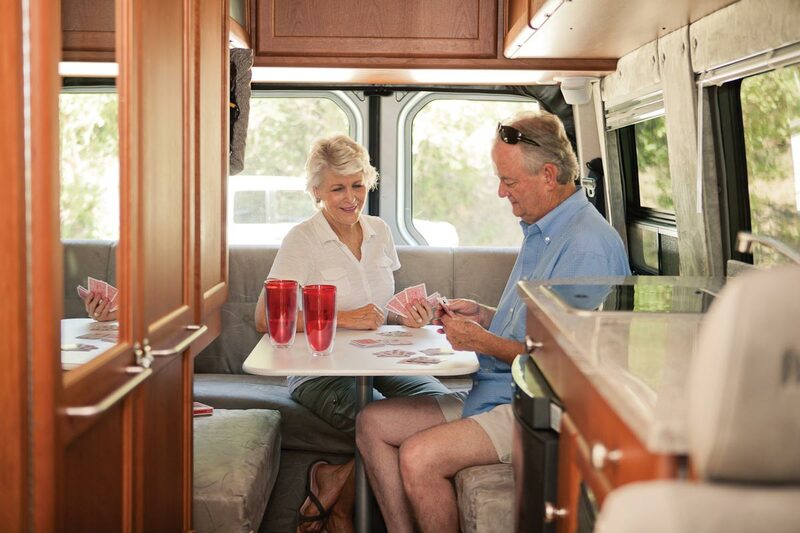 These are ways to save while RVing, but the best opportunities arise at a moment’s notice. Keep an open mind while travelling and you might come across some unexpected savings! How do you save money while on the road? Let us know!